In 5th Grade with Teacher Julia: Halloween Math Activities! October 2nd, I broke out the Halloween decorations in my classroom. Today, I decided it was time for the Halloween Math Activities that I created. Some ideas were borrowed from the AWESOME 5th grade teacher, Shelly Rees at Appletastic: Blossoming in 5th Grade and others I created myself. This is my third year teaching math with Everyday Math and it's also the third year that, as a whole, my class did not do well on the Unit 2 assessment. 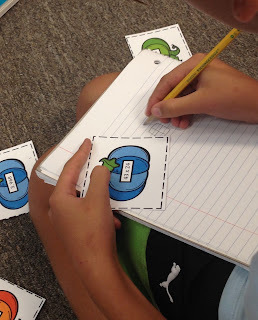 It is the unit that teaches a bunch of different strategies for addition, subtraction and multiplication. It was even hard for me to keep up with each strategy during my first year! 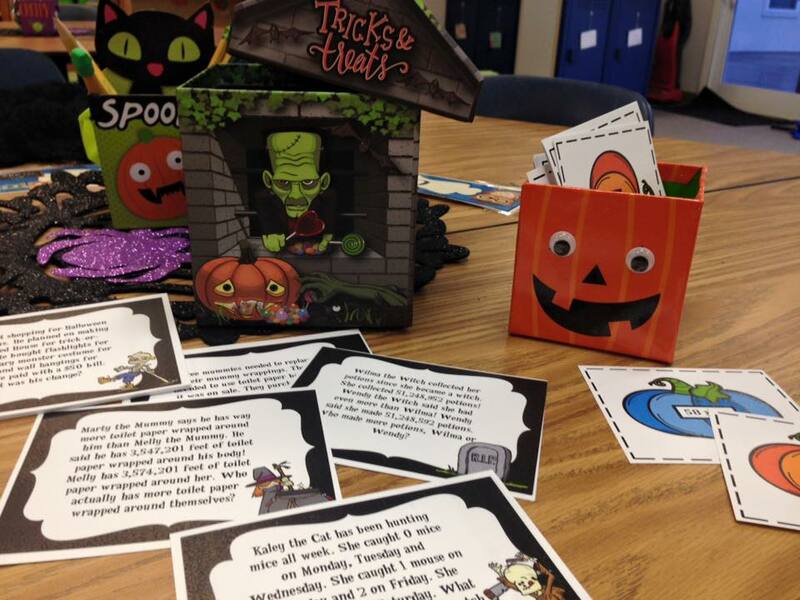 So, I decided that this year, when we review the concepts it would be with some Spooky Halloween Math Games! 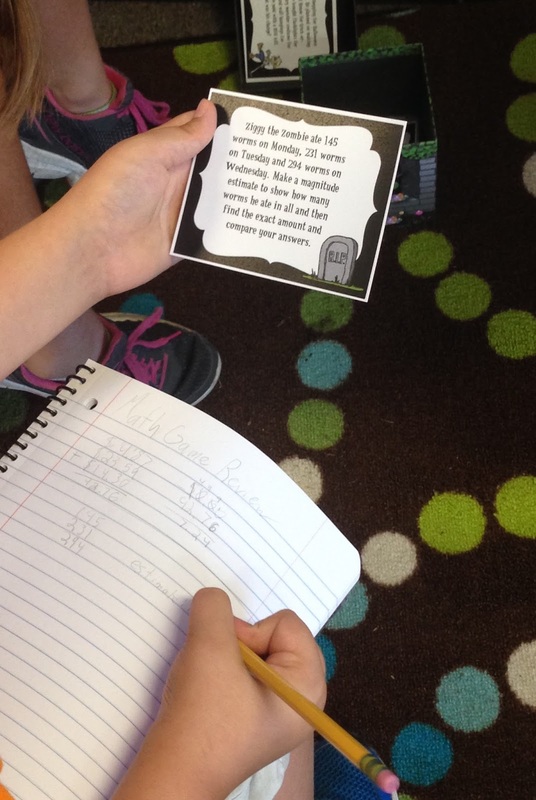 This game requires students to practice 2 and 3-digit multiplication. A group member picks an eyeball with a math fact on it. The group completes the problem and the student who picked the eyeball can place it in the hole of the correct answer! They LOVED the idea of playing with eyeballs! I found the amazing boxes that hold the task cards at the Dollar Tree. In fact, I found all of these Halloween materials there! This activity practices a variety of Math Word Problems using task cards that have fun names and silly scenarios written on them. The kids told me afterwards that it was so much fun to read the story and then do the math that went along with it. Score! This game also practices multiplying with 2 and 3-digit numbers. Students spread out the pumpkins with the products on them and make a pile with the pumpkins that have math facts on them. One group member chooses a math fact, the group answers it separately in their notebook and then if the person who chose the pumpkin gets the correct answer, they make a pair with the product and the math fact. Students said they liked how they were trying to collect as many pumpkins as they could!